If your veterinarian has prescribed Baytril for your cat, you should educate yourself on the uses and side effects of this common antibiotic. Many veterinarians prefer Baytril's active ingredient, enrofloxacin, over other types of veterinary antibiotics because it is both fast-acting and highly effective. Unfortunately, enrofloxacin has also been linked to several severe side effects. Baytril is manufactured by the Bayer drug company and contains the active ingredient enrofloxacin. It is marketed specifically for veterinary purposes. It is a powerful, broad spectrum antibiotic classified as a fluoroquinolone drug. The phrase "broad spectrum" indicates the agent affects bacteria that test both Gram-positive and Gram-negative. The average pet owner may not be familiar with terms such as Gram-positive and Gram-negative, but these labels illustrate how widely Baytril can be used to treat all manner of infectious diseases. The particular mechanism behind Baytril is that it has the ability to interrupt a bacteria's DNA metabolism, thus disabling and killing the organism. Baytril acts quickly. This makes it a first choice amongst veterinarians against pet ailments such as ear, urinary, digestive, and respiratory infections. Fluoroquinolone antibiotics can cause serious side effects. Drugs that are as widely effective against such a broad spectrum of bacteria are generally toxic, even to the host organism. Baytril permeates the body's tissues rapidly and deeply. This makes it very effective against even the most hidden pathogens. Unfortunately, a drug that features the strength, rapidity, and efficacy of Baytril can also produce strong, rapid, and very disarming side effects. One side effect that has been listed as more common in cats is retinal damage that leads to blindness. Not all animals taking Baytril will experience notable side effects. In order to assure your animal's safety during treatment, it is important that your pet not receive more than the recommended dosage of Baytril. 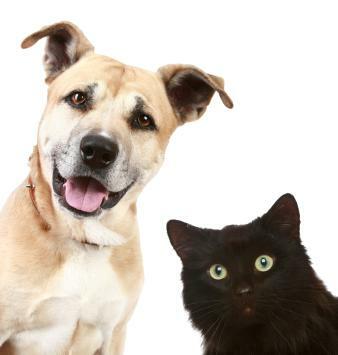 Discuss all of your pet's prior health issues with a veterinarian before beginning the treatment. Baytril is not advised for growing animals such as puppies and kittens. The drug can interfere with an animal's development, leading to poor connective tissue growth. This symptom is reportedly more common in dogs than in cats, but it is still a reasonable concern for both species. Pregnant cats and nursing pets should not take Baytril because the drug easily crosses over into the placenta or milk supply. It is also not recommended in the case of elderly felines or cats that suffer from kidney disease. Another major concern for Baytril is drug interactions. Baytril does not mix easily with other prescription drug treatments. Doing so may have dangerous and potentially lethal consequences. Your pet's chances of enduring a safe course of Baytril are greatly increased when you choose a veterinarian who is experienced regarding the drug's usage. Most of the severe side effects occurring from Baytril are the result of improper dosing. Your pet's proper dosage depends on its size and weight. If there is any question as to the proper dosage, a minimum amount should be used to start. If symptoms do not improve markedly after one week, then dosage can be increased slowly up to the maximum amount your veterinarian suggests. Baytril is typically prescribed for home usage in a coated tablet form. Other delivery methods include injections or intravenous drips, but these are only available by office or hospice care under the supervision of a veterinarian. Baytril injections are not recommended for cats because they may increase the chances of certain side effects. As with all medications, Baytril should be stored in a cool dry place away from both children and pets.